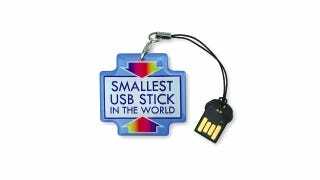 I find it ironic that the company who now holds the record for world's smallest flash drive is in the business of promotional trade show tchotchkes. Because there's absolutely no room to brand this drive except for a hanging tag. Deonet will slap your company's logo or URL on a variety of giveaway items, but not on this minuscule new flash drive—at least not without including a branded magnifying glass. Measuring just 0.77 by 0.57 inches, and a mere 0.11 inches thick, the drive is able to be so small thanks to the Micro UDP chip approach. UDP stands for 'USB Disk In Package' and basically saves space by baking all of the electronics into a single moulded plastic drive. So the included tethered tag is the only place a logo could go.